If you've ever used Expedia, Orbitz or Bing Travel, you're probably used to a visual assault of check boxes, drop-down lists, radio buttons, advertisements and special offers. ITA Software's existing Website is better, but let's see Google bring some of its classic simplicity to travel search. I'd kill for a single text box that let could parse out search terms like "LA to NY July 4." Currently, Google Maps can tell you how long it takes to travel somewhere by car, bike, foot or public transit. How about a fifth option for air? A feature in Maps could provide rough estimates of travel time, and then give you the option to search for fares. 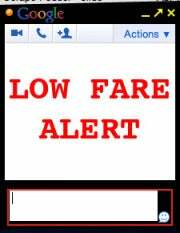 Alerting travelers of low fares isn't a new concept, but Google could gain the upper hand by tying alerts into other Google services. Imagine getting a message in Google Chat or on an Android phone in addition to the e-mail alerts that some companies offer. And unlike Expedia's Fare Alert or Southwest's Ding, I'd expect Google to handle alerts directly in the web browser instead of making users install software. I'm not sure if there's a way to improve the airfare predictions that Bing currently offers, but it's an essential tool for travelers who like to fret over getting the best deals. Google's algorithm experts need to come up with something similar, or Bing will still be the travel search engine to beat.